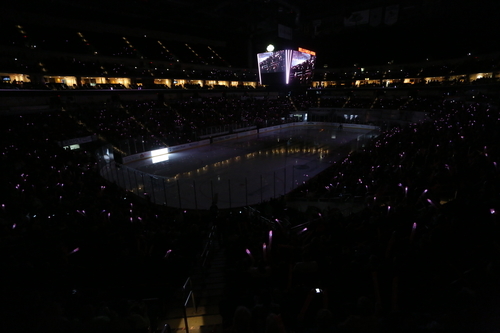 You are here: Home » Blog » Pink in the Rink Raises Nearly $45,000! Thank you for making Pink in the Rink such a great night! We had such a wonderful time being a part of the Iowa Wild hockey game this past Saturday! We were able to show people who we are, showcase the importance of our work, and recognize our AMAZING breast cancer survivors as well! We also had the opportunity to do a few things which helped generate the funds that are so important to fulfilling our mission. Through the live jersey auction, ticket sales, raffle, silent auction, donations, and the support of our wonderful sponsor, Sammons Financial Group, we were able to raise nearly $45,000 from this event! Thank you to everyone who came out to the event, and to everyone else who continues to spread awareness and advocate the importance of our mission!